Australians are underestimating the amount of salt they eat by at least a third a new study has found. After studying the diets of more than 400 Australians, The George Institute for Global Health found, on average, study participants consumed at least 9 grams of salt a day. The average participant thought they were only taking in 6.8 grams daily. 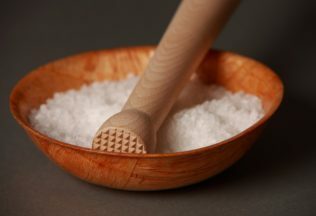 Researcher, Associate Professor Jacqui Webster, said the findings show Australians are still largely unaware about the amount of salt in their diets. “The dangers associated with eating too much salt are widely known, yet we are consuming way too much every single day, more than double than what is recommended,” Professor Webster said. The Australian Heart Foundation recommends adults consume no more than 6g, or one teaspoon, of salt per day. Professor Webster said Australians need to watch how much salt they are adding to their food, along with how much they are consuming through foods such as bread, processed meat, sauces and salty snacks. She has called on the food industry to also consider the amount of food in their products. “We need to stop adding salt unnecessarily onto our foods when preparing meals at home,” Professor Webster said. “But more importantly we need more manufacturers to reduce the amount of salt in the foods we consume. We’ve had some progress through government salt reduction targets but efforts need to be increased,” she stated.